Last week, we presented some basic features of the ARPHA Writing Tool (AWT), focusing on the collaborative authoring process. This post will add the novelties that ARPHA has adopted when it comes to submission and post-submission processes. Checks are a must whenever high-quality, professional writing is concerned. Shortly before submitting their manuscripts via ARPHA, the authors are free to initiate the first step of the validation process at any time. As a result, an automated technical check runs through the manuscript to verify its consistency and compliance with the JATS (Journal Article Tag Suite) standard as well as key elements of the journal’s policy. After the automated checks, there is a second-layer of human checks made by RIO editorial assistants in order to bring the manuscript to a pre-publication level. They check compliance with further elements of the journal’s policy as well as linguistic consistency and work with the authors before finalising it altogether. Even after submission, collaboration continues. With the peer-review stage being as transparent and open as the whole vision of RIO is, this step is no less straightforward and organised. All peer reviews are automatically consolidated into a single online file that makes the editorial process simple and pleasant. This is made possible by the XML-based workflow in the AWT. Last week, we mentioned that an author can invite reviewers during the authoring stage itself. 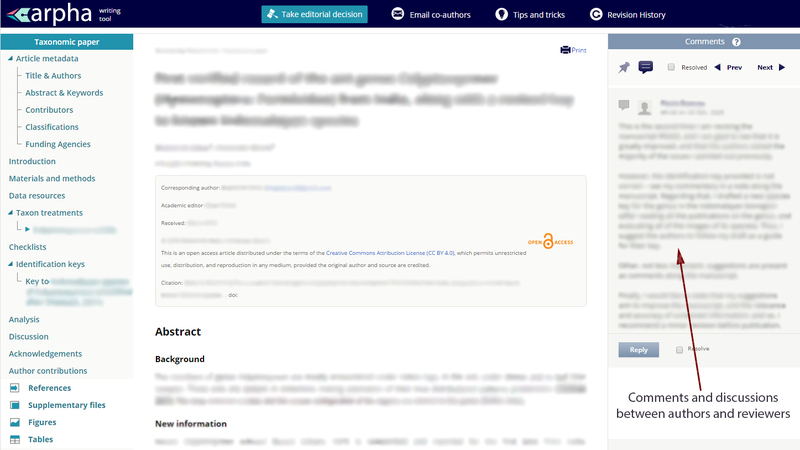 Let us elaborate here by saying that the ARPHA Writing Tool provides a functionality for pre-submission peer review(s) performed during the authoring process. These peer reviews are submitted together with the manuscript, so that the editorial evaluation and publication can be significantly sped up. Even after an article is brought to life, ARPHA continues to play a role in it. Because of the XML workflow, authors are able to publish updated versions of their articles at any time. Once they request such an update, their work is returned to the ARPHA Writing Tool, where authors and peers are to collaborate once again. Eventually, the two versions are linked via CrossMark, so that nothing is lost. As you might have already noticed, just like RIO, the new ARPHA Writing Tool is constructed entirely around the needs of its authors. Why not find out yourself by giving ARPHA & RIO a try when they open for submission early next month?